In this thought-provoking guide, Dutch Sheets provides a thorough, balanced, and clearly set out introduction to the key principles of intercessory prayer. Dutch shows in detail how God makes us partners in releasing the results of Christ's atonement. 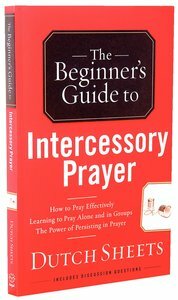 About "The Beginner's Guide to Intercessory Prayer"
What is intercessory prayer? How can I become an intercessor? When you don't know where to begin, start with the basics In The Beginner's Guide to Intercessory Prayer, readers will learn to find their motivation for prayer in the power of love, by first and foremost experiencing a lasting relationship with God as Father and friend. As Dutch Sheets lays the foundation for one's motivation to pray, he teaches that the simplicity and purity of devotion - our relationship with Christ - doesn't need to be complex. Find the complexity of prayer reduced through "Did You Understand" questions at the end of each chapter to test your understanding. Upon completion you will have learned the 13 "P's" of intercession, ranging from "Priority" to "Pleasure" and from "Plan" to "Pain." Make intercessory prayer a part of your life by learning to pray effectively, by learning to pray alone and in groups and by persisting in prayer. What is intercessory prayer? How can I become an intercessor? When you donat know where to begin, start with the basics! In The Beginneras Guide to Intercessory Prayer, readers will learn to find their motivation for prayer in the power of love, by first and foremost experiencing a lasting relationship with God as Father and friend. As Dutch Sheets lays the foundation for oneas motivation to pray, he teaches that the simplicity and purity of devotion ao our relationship with Christ ao doesnat need to be complex. Find the complexity of prayer reduced through aDid You Understanda questions at the end of each chapter to test your understanding. Upon completion you will have learned the 13 aPasa of intercession, ranging from aPrioritya to aPleasurea and from aPlana to aPain.a Make intercessory prayer a part of your life by learning to pray effectively, by learning to pray alone and in groups and by persisting in prayer.